Steve had scoped out this section on the topos and determined that it dropped over 700 fpm. We knew that there was one ~35 foot plunge falls in there but the rest of it was a mystery. As time passed we grew more intrigued... Was there an ultra-classic run waiting in there or was it an unrunnable mess? Finally Steve and I got our chance in the winter of 2000. 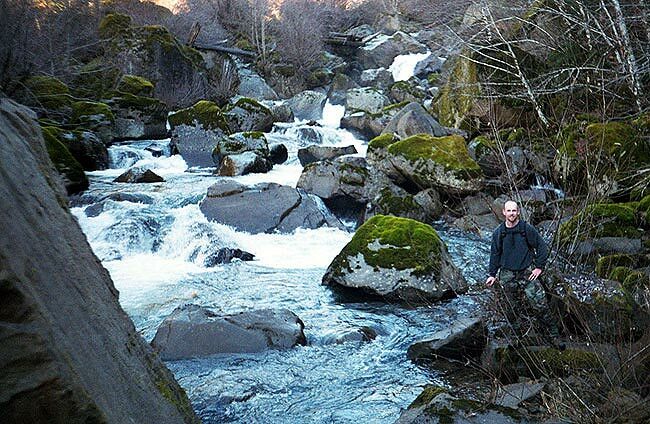 We were on a road trip and decided that the low flows in the SF Coquille made an extensive recon of the canyon a feasible option. We wisely decided not to take our boats into the canyon as the gradient had us a little suspicious that we might be in for a long day if the run turned out to be totally out of control. We packed up a little climbing gear (in case we had to rappel past any falls) and headed upstream. We headed up along on the small asphalt road that follows the South Fork up to the headwaters. 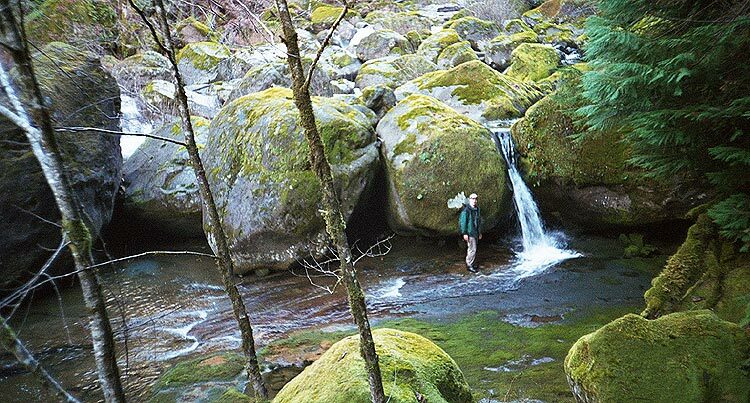 We left one car at the trailhead for Coquille Falls, which is also the put in for the class V run known as 'The Gem'. Upstream we parked where the river came back to the road. With growing anticipation we strapped on our packs and scrambled downstream. 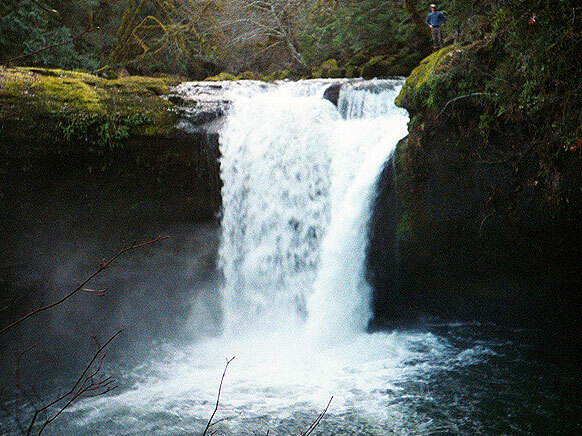 We quickly located the beautiful upper falls that marks the entrance of the canyon. This huge plunge falls looked really good but we were worried about what might be lurking beneath the surface, so we decided to wait until we could probe the depth of the pool in the summer. Soon the river began to pinch off and some big boulders blocked our downward progress along the bank. Steve climbed up and around while I started to do a tricky, technical traverse across the rock face, ten feet above the river. Soon the holds ran out and I was faced with a long dyno across six feet of blank rock to the next set of holds. Never one to hesitate in these situations, I took a deep breath, wound up, and cut loose across the rock face. I flew through the air and my hands latched onto the holds on the far side but my boots were miserably wet and slick so my feet cut loose immediately. For a long second I hung on but the combined weight of my pack and heavy boots dragged me off and I cartwheeled into the river. I hit the water and went deep, surfacing almost immediately, though I quickly found out how hard it is to swim without a PFD and WITH a pack on your back! For a few tense seconds I couldn't find a way out but finally climbed up onto a large boulder downstream, wet and embarrassed. I had lost track of Steve, who had found his way back down to the river, but soon we were reunited and back on track. Downstream the river tilted on edge and started to tear down through some of the gnarliest whitewater I have ever seen. Most everything would be runnable V to V+ with more water, but there were a few logs that presented problems. Also, there were huge sieves everywhere due to the bouldery, unsolidified nature of the riverbed combined with the very high gradient. Overall, this run is definitely class VI. 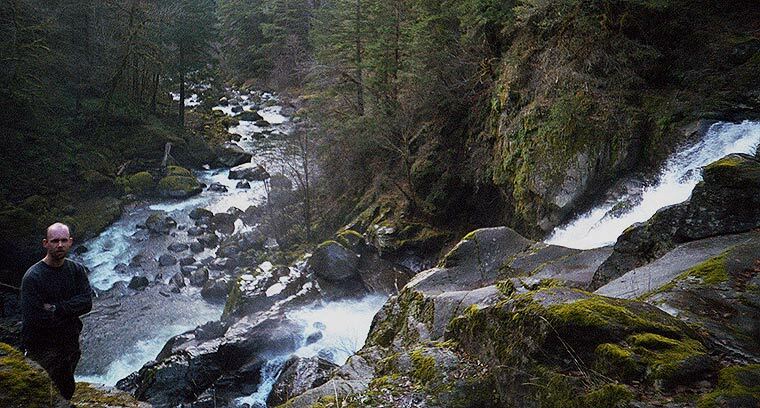 Eventually the riverbed solidified into bedrock as we neared Coquille falls and we found a nice 15 foot falls and some other huge, huge HUGE boulder gardens that absolutely defy description. One fifty foot tall boulder slalom really took my breath away and might have been runnable but by this time we were running out of daylight so we were moving fast to avoid a long hike out in the dark. 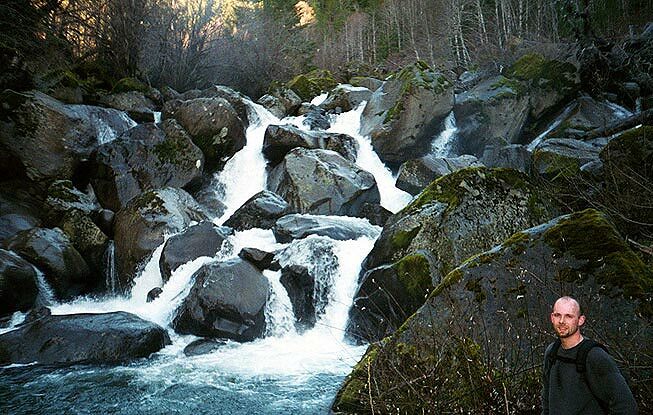 Eventually we arrived at Coquille Falls, a beautiful 120 foot double drop. The first part is a 40 footer that may be runnable if the pool is deep enough. 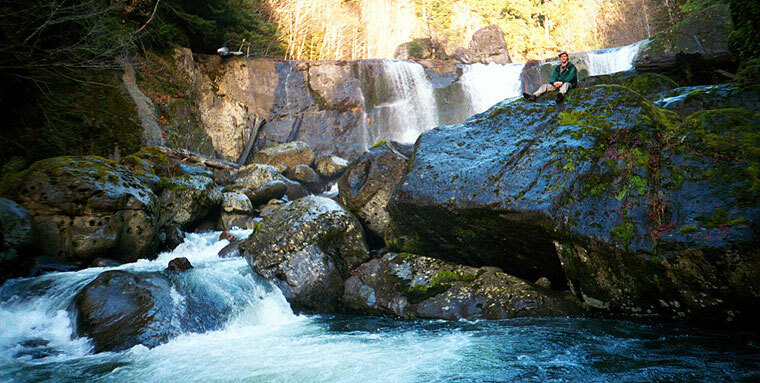 Below this falls is a short boulder slalom which leads to then second falls, an awe-inspiring 80 footer that terminates in the pool above the put-in for the gem. This second drop pours onto rocks, unfortunately. The author with the 40 foot falls behind him. This photo was taken from the lip of the 80 footer. Steve standing at the lip of the 80 footer. Below are the first few rapids on the class V run known as 'The Gem'.